Episode 1 of “Black Summer” (2019) looks quite promising. The hectic first episode of “Black Summer,” Netflix’ new zombie series, looks like ambitious stuff — it plays like a hybrid of “28 Days Later” (2002), “Pulp Fiction” (1994) and “24” (2001-2014). While it seems unlikely that this show can emulate the greatness of those classics, “Black Summer” still gets off to a damned good start. I’d rate the first episode an 8 out of 10 for being a pretty lean and mean start to a decent zombie series. Part of the episode’s appeal is its frantic vibe and format — something that seems like a deliberate contrast to “The Walking Dead’s” slowly placed, methodical epic. The viewer is plopped down into the middle of a heartland neighborhood evacuation effort, three weeks into a zombie epidemic. With a series of lengthy, real-time tracking shots, we race beside a collection of unconnected characters who are desperately trying to reach United States Army pickup point. The zombies are few in number. But they are the “high-speed zombies” that most modern horror viewers associate with Danny Boyle’s film, so the arrival of even one imperils the fleeing families. The makeup effects are good, the transformation process is effectively rendered, and the show is satisfyingly scary. The show makes this even more interesting by filming each character’s dash individually, and then showing them as discrete vignettes that are out of chronological order. The story is weakest when it slows down enough to allow its characters to talk. The dialogue is truly bad, even if the quick action sequences make up for it. (Has there ever been a more generic bribery offer, for example, then the one we see here?) But this weakness doesn’t much affect the overall quality of an episode that follows so much action. First, it has some fine performers. These include two “Game of Thrones” actors who are always fun to watch — the mesmerizing Natalie Dormer and the consistently likable John Bradley. (The latter seems to specialize in winning audiences over as the “hero’s-affable-friend” role.) “Doctor Who” fans will of course recognize Matt Smith in the lead role. But by far and away, they’re overshadowed by a fantastic performance by Stanley Tucci as the zombies’ surprisingly eloquent leader. (More on that in a moment.) Tucci is truly a great actor and he makes a perfectly menacing bad guy; his voice, diction and line delivery are goddam perfect. His talent for voicing a magnetic, highly intelligent antagonist reminds me of Jeffrey Dean Morgan’s portrayal of Negan on “The Walking Dead,” or one of the better “big bads” seen on “24” (2001 – 2014). Second, there are some really clever ideas hiding under this thin, hasty script. (I strongly get the sense that “Patient Zero” was a rush job for screenwriter Mike Le and director Vincent Newman.) The hyper-kinetic zombies here are afflicted with “super-rabies” and are reminiscent of their ilk from “28 Days Later.” But there is a truly intriguing plot conceit — their roars and screams are perfectly intelligible to Smith’s protagonist. He speaks their “language” because he’s infected, but also mysteriously asymptomatic. When he interrogates the zombies for the military, their interaction is filmed as normal dialogue (creating the opportunity for Tucci’s terrific turn here). Then things get even more interesting when it’s demonstrated that the ostensibly mindless zombies are quite proficient at planning an attack. I … might be treating this movie a bit charitably simply because I liked some of its ingredients. Again, I don’t actually recommend it. But your mileage may vary. The first two “Jeepers Creepers” movies are vastly underrated classics, in my opinion — they’re well scripted and boast a truly original and frightening bogeyman. The third, regrettably, struggles to retain even a B movie charm. It’s a substandard horror film that I’d only grudgingly rate a 4 out of 10. “Jeepers Creepers 3” (2017) is cloddishly written and awkwardly filmed. The film also suffers from action sequences that are absolutely cartoonish. A lot of this stems from the titular Creeper’s antique vehicle, which is now inexplicably depicted as being … conscious? Possessed by the Creeper? It drives itself, deflects bullets, launches projectiles, and contains booby traps that defy physics. This leads to some Wile E. Coyote-style fight scenes with the story’s various protagonists, in which the saddest victim is the franchise’s credibility. With all of this exposition, though, one bit of lore is egregiously omitted – contrary to some of the movie’s advance press, we learn nothing about the creature’s origins. And this is extremely odd, because a bunch of characters do. There is a befuddling central plot point where the good guys methodically gain knowledge of their otherworldly foe by … touching one of its severed body parts. But we, the viewers, learn nothing. Even the makeup and special effects were inferior to the prior films. I’m confused by all of the things I’ve written above, as “Jeepers Creepers 3” was written and directed by Victor Salva, who wrote and directed the excellent previous movies in 2001 and 2003. I hope I’m not being too hard on the movie, because there’s still some fun to be had. Jonathan Breck still chews the scenery quite nicely as the Creeper, and the monster’s character concept still manages to please. In a horror movie market often dominated by seemingly interchangeable serial killers and undead little girls, the Creeper is a truly inventive monster — part human; part gargoyle; part body-stealing, feral Frankenstein’s monster. He’s fun to watch, particularly for horror fans who’ve grown tired of the Patrick Batemans and the various angry ghost children that endlessly haunt the zeitgeist. You could do a lot worse for a plot-driving antagonist. And, thanks to so brutal a bad guy, there are occasional moments of tension in the movie. It’s a bit scary, for example, when he attacks a group of teenaged motorcyclists. This isn’t enough to make recommend paying for the movie, however — even if you’re a fan of the franchise, as I am. I’d wait for “Jeepers Creepers 3” to hit Netflix or Hulu, or wait until it’s playing on SyFy again. 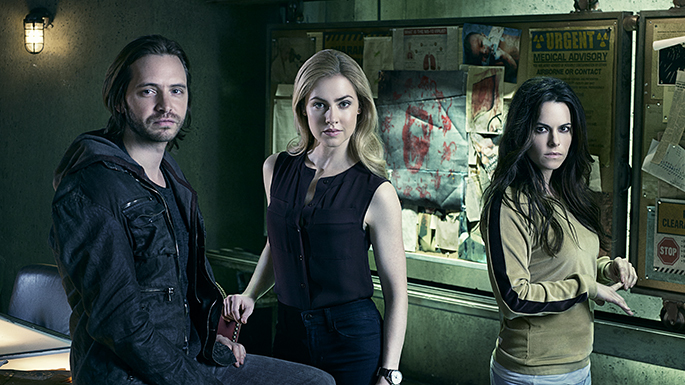 SyFy’s “12 Monkeys” isn’t too shabby. There’s the occasional cliche, some flat acting, and too little tension at times, but SyFy’s serialization of the classic “12 Monkeys” film (1998) isn’t as bad as we all feared. I watched the first two episodes via the network’s website, and it at least held my attention. It’s a suitably dark show with at least one nice twist, and it’s got an obvious reverence for its source material. With a plot so reliant on twists and details and surprises, I can only imagine how hard it might be to turn into a tv show. I’m going to give this show a chance.